Discover Vietnam in our 12-day tour to get general view of a beautiful and charming country located in Southeast Asia. Join in our journey, you will have chance to visit the most outstanding destinations in Vietnam spreading out from the North to the South like Hanoi, Halong Bay, Hue, Hoi An, Ho Chi Minh City and Mekong Delta where their natural beauty and cultural values are harmoniously blended in each region. Your private driver and guide will pick you up from Noi Bai International Airport and take you to check in our hotel. After relaxing time, escape from hustling and bustling city to soak into The Quintessence of Tonkin traditional show which is next to Thay pagoda. With the combination of ancient history and ultramodern technology, this amazing live show is a must-see for Hanoi tours. 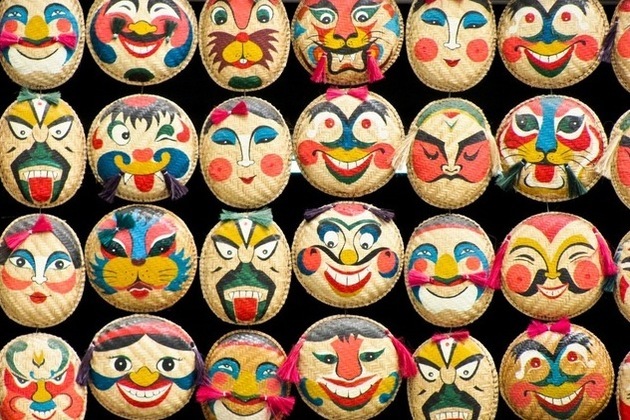 Start your tour with the historic tour in Dong Ngac Cultural Village to visit Cultural Heritage Site which worships local heroes. Next, you will have an amazing experience with the market tour and have a chance to prepare for your lunch with foods buying with tour guide’s help. Next, you will visit 300 years old house of Do family with ancient architecture and back to traditional house to cook lunch by yourself. You will surely have a delicious meal with host’s guide and special Vietnamese recipe. After lunch, you will relax in host’s peaceful garden. 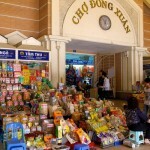 The rest of the day, we back to Hanoi center to join Food Tasting Tour. We first walk around Old Quarter, taste various kinds of local food and drink along tiny and bustling streets like tofu, rice pancake, oil-fried pastry, pillow cake, stuff pancake with pork, egg coffee, and draught beer, etc. 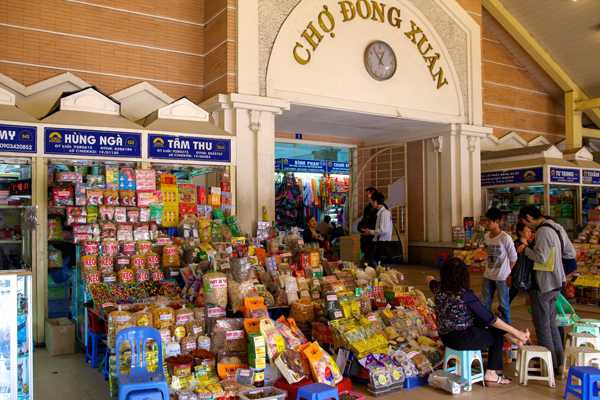 Then is a pleasant time when we stop at Dong Xuan Market – one of the largest markets in Hanoi and visit many small booths where local businessman sell a hundred kinds of goods. To end our trip today, we will have a light dinner in cozy Rue Lamblot Restaurant with spring rolls, grilled pork noodle, fried rice cake and banana flower salad. Around 8 pm, we back to our hotel for rest. Leaving Hanoi to travel to Halong Bay – The World Natural Heritage which is known for stunning landscapes and amazing cruise tour. We will then savor a delectable lunch while the cruise sails among the limestone islands. In the mid-afternoon, we will kayak among the hidden areas of the bay, around the Bo Nau Cave area before going back to our and continue cruising to Soi Sim Island. Go swimming and relaxing at the beach of Soi Sim or climb up to the top of the island for a panorama view of Halong Bay. To sight-see Halong Bay lively, we will board V’Spirit Classic Cruise when we arrive. While cruising deeper into the bay, we enjoy our tasty lunch and marvel at magnificent landscapes. In the mid-afternoon, we will warm-up our body by kayaking around the Bo Nau Cave. Then, the cruise takes us to Soi Sim Island where we will swim and relax on the beach or enjoy majestic view of Halong Bay from the top of the island. Itinerary today will ends when we back to the cruise for having dinner and taking a rest after a long day. Overnight on the boat. 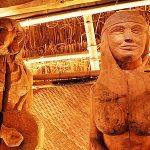 Wake up early in the morning and have breakfast on the cruise, we then start our journey with Tai Chi exercises or a photo hunt. Sung Sot Cave (Amazing Cave) is our next site which is considered as the most beautiful cave in Halong Bay. We embark back on the boat for check out our cabin before continue discovering the bay with Ba Hang Fishing Village and Dog Islet, etc. Heading back to the port is an interesting time for us to enjoy a Vietnamese traditional meal immediately after watching cooking demonstration of chef. At noon, we disembark the cruise and then back to Hanoi. Our driver will take us to Hanoi Railway Station for the train to Hue (SE1, 7.30 pm – 8.48 am) after resting and having dinner (on our own account). Overnight on the train. When arrival, let’s recovering ourselves after a long haul train with Bun Bo Hue (Hue’s noodle with beef) – a typical dish of Hue. After check in our hotel, we board Dragon Boat to enjoy tranquil scenery of this city along beautiful and poetic Huong River (Perfume River). 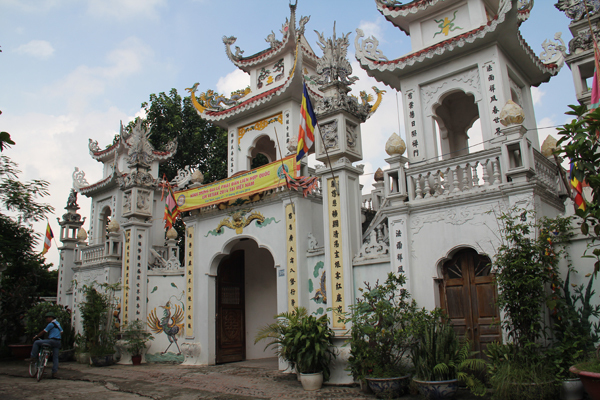 Next, we will visit charming Thien Mu Pagoda (Lady Pagoda) – one of the most Buddhism pagoda in Vietnam built in 18th century. Here, our tour guide will present for us Buddhism and Monk Monastery before having vegetarian meal with potatoes, carrots, mung beans, mushrooms, lotus seeds and soy sauce, etc together. Being an old capital of Vietnam, Hue today is famous for its remained antique tombs and citadel. Therefore, the rest of the day, we will visit Tu Duc Tomb, Hue Imperial Citadel and many monuments to gain more insights into a part of history of Vietnam. End our trip by walking around Dong Ba Market. Overnight in Hue. Take the scenic route this morning for a visit to suburb of Hue toward Thanh Toan Brigde (built in Chinese style). Relax ourselves while riding bike through small village and viewing vast verdant fields along the road. On the way, we can stop for photo shooting or talk with local residents. Thanh Toan Agricultural Museum is our next site where we can know more about origin of Vietnamese’s agriculture over a thousand years. Besides, our guide also give us history and importance of Thanh Toan Bridge when we visit it. We can have closer look about local life by riding to a local market where various kinds of countryside goods sold like vegetable, meats, fishes, shrimps and other poultry. Continue setting foot to traditional villages making “non la” (Conical hat) before return to city centre to explore every Hue’s corner by a bike tour in the rest of the day. Overnight in Hue. This morning, south through Hoi An Ancient Town along highway 1A. During the trip, we will stop to marvel breathtaking landscapes of the north to Lang Co Beach and the south to Danang City. 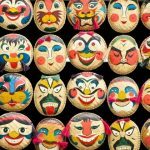 When in Danang, Cham Museum – one of the most adequate collections of Cham Artifacts in the world will be our first site we visit. Next, we move to China Beach where used to be a relaxing place of American. Last but not least, we will set our foot on Ngu Hanh Son (Marble Mountain) including 5 limestone mountains rising on the beach to contemplate the majestic scenery of the city from the height of over 100m. In the afternoon, we transfer to Hoi An – one of the most worth-visit destination of Vietnam which is famous for its ancient and tranquil beauty. 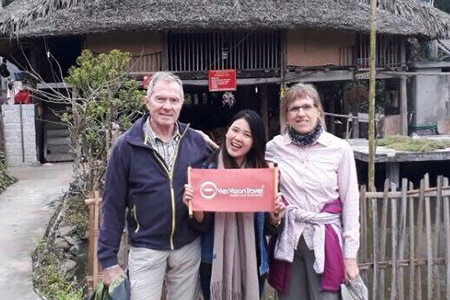 Your walking tour includes many well-known attractions in Hoi An like Japanese Covered Bridge, Pottery Museum, Tan Ky Ancient Assembly Hall, Cantonese Congregation, silk street, temples and pagodas of Chinese appearance, etc. End the day by returning to hotel and taking a rest. Overnight in Hoi An. 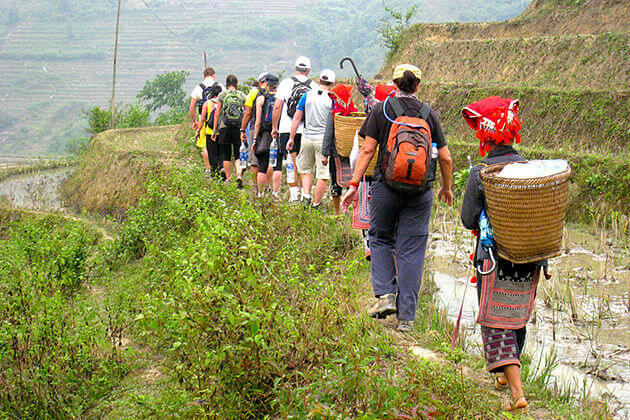 Start the trip today with our Farming and Fishing Life Eco Tour to get experiences as a truly Vietnamese farmer. Head to Tra Que Village in the Northeast about 3km far from Hoi An, we will join in some interesting agricultural activities with local farmers such as preparing land for sowing, fertilizing the garden by using seaweed from the river and watering it with big tin cans. 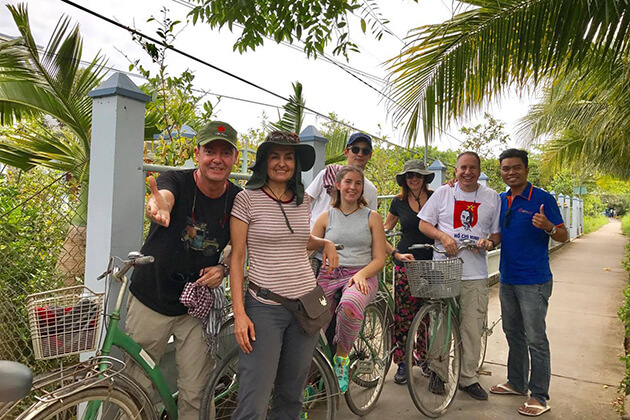 Continue witness Vietnamese’s life in countryside by taking bike tour before boarding Hoi An Eco-Tour boat in the late morning. Cruise on a river and watch how local fisherman catch fishes then experience it by ourselves with traditional fishing net. Here, we also have a quick race by rowing unique Vietnamese traditional bamboo basket boats and ride down to a coconut palm lined waterway. Back to our boat and have lunch made by vegetables from Tra Que Village. After lunch is your free time to walk around Hoi An, relax on the beach and shopping, etc. Overnight in Hoi An. Itinerary this afternoon is optional for us with one famous attraction of Quang Nam Province – My Son Sanctuary which is 75km far from Hoi An. My Son Sanctuary is considered as one of the most foremost Hindu temple complexes in Southeast Asia and the foremost heritage site of this nature in Vietnam. From 4th to 14th century, My Son Sanctuary was ruled by Champa’s Kings then became a burial place of Cham heroes. Here, we also visit Simhapura (Tra Kieu) capital – the old administration center of Champa Kingdom and other remained ancient towers from 4th century. 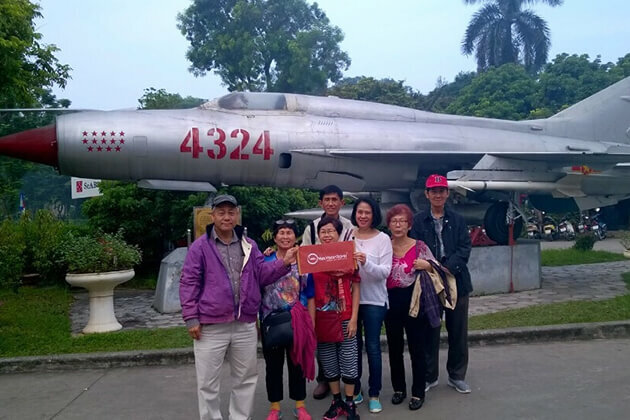 Warmly welcomed in Ho Chi Minh City in this morning after a short flight (VN 7113, 9.30am – 10.20am) then we quickly transfer to Cu Chi Tunnel – one of the most well-known historical monument of Vietnam. Cu Chi Tunnel is a secret underground system built in Vietnam War and Indochina War including innumerable trap doors, living areas, storage facilities, hospitals, kitchens, weapon factories and command centers with the length of over 250m in the total. Here, we can also witness other remaining historical vestiges of a magnanimous period of time like an US tank or many bomb holes made by 500lb bombs. Check in our hotel when back to Ho Chi Minh City and take rest before join in Vespa tour in the evening. Depart from the hotel, our guide will pick us up and drive around the city for street food adventure. Firstly, let’s enjoy a cocktail and appetizer at Café Zoom in District 1 and get an interesting glance about local people’s life. Then, we drive to Chinatown and bustling and hustling streets and alley in District 4 to taste street seafood, seafood and blend with eventful atmosphere of the night life with locals and other foreigners as well. Shift the direction to District 1 where we can enjoy unique taste of one of the most well-known specialty of Saigon – Banh Xeo (Saigon Special Pancake). Continue the tour with a Vietnamese-style coffee shop for relax ourselves with live music performances. At 10pm, tour ends and we comeback to hotel for recovering after a long busy day. 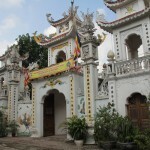 Head to Cai Be in the Mekong Delta after breakfast at hotel, we will set foot in Cao Dai Cai Be Temple and Cai Be French Gothic Cathedral to get insights into different religions of local people. 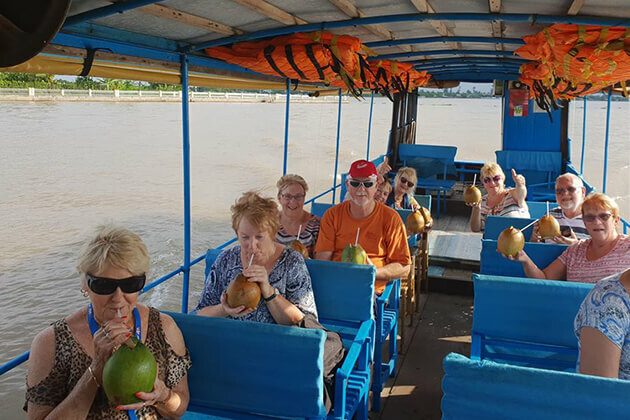 Embark on a boat, we then visit inland and floating market of Cai Be where we know more about agricultural, aquatic products and buy them for our dinner with the help of guide. Next, we check in our room in Mekong Eco Lodge in Tan Phong Island and have lunch. In the afternoon, we will have enjoyable time when catching fishes on the river for the dinner by ourselves. Back to Mekong Eco Lodge, we will bring all the ingredients we had bought and caught for chefs and join in cooking process with them. Overnight in Mekong Eco Lodge. 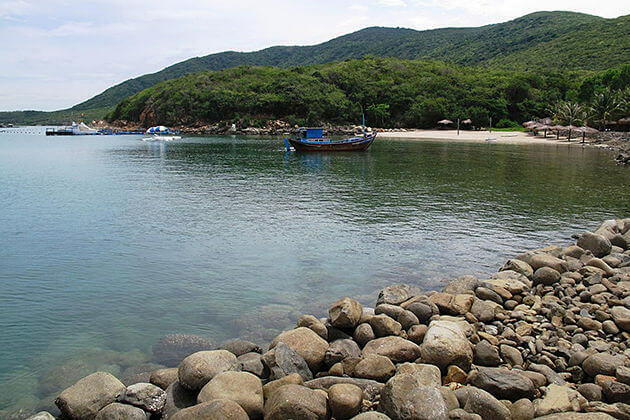 Morning sightseeing with our guide introduces us to Tan Phong Island. 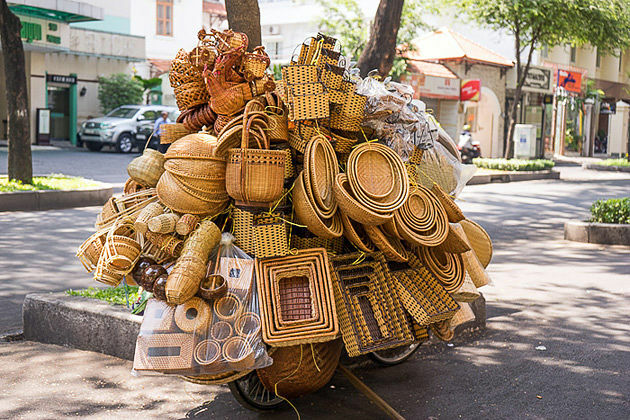 By bike, we will visit traditional handicraft workshops selling handbags, wooden chairs and tables. We can also know how local farmer take care of their garden by visiting their house then have an informal talk with them while tasting the fruits that is just picked from the garden. 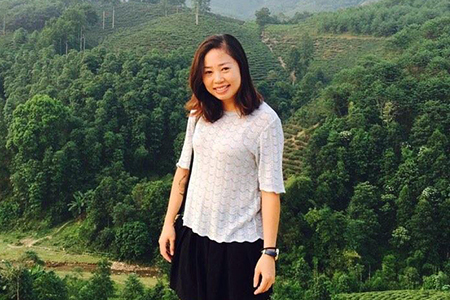 Leave the rural area, we return to Ho Chi Minh City and have a farewell party in a cozy local restaurant. Overnight in Ho Chi Minh City.